Outside of Beijing City lies the City Province (Municipality) of Beijing, where there are even more worthwhile monumental, historical and scenic sites to visit and enjoy. Starting with an Introduction and Overview of the Cities' Province and its facts and figures, this text Reviews the highlights and Main Scenic Sights to be visited in and around The Province. From those Monuments located nearest Beijing and those most well-known, to the remote and more obscure this pages gives a short but thorough introduction to Beijing City Province and its historic Monuments. Covering a surface area of 16 Thousand 800 Square Kilometers (6.487 sq. Miles) Beijing Municipality is one of China's 4 large City Provinces. 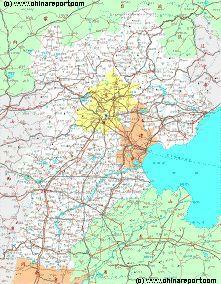 To the South-East lies Tianjin Municipality and all other surrounding area's are taken up by Hebei Province. Today Beijing Municipality counts some 15 Million + inhabitants, spread over 16 Districts and 2 Townships. For proper understanding and easy navigation and travel throughout the Province however, it is easier to see things in a slightly simplified perspective. For all practical purposes, the recently "unlocked" City Province can be divided into Three Rings or Layers. 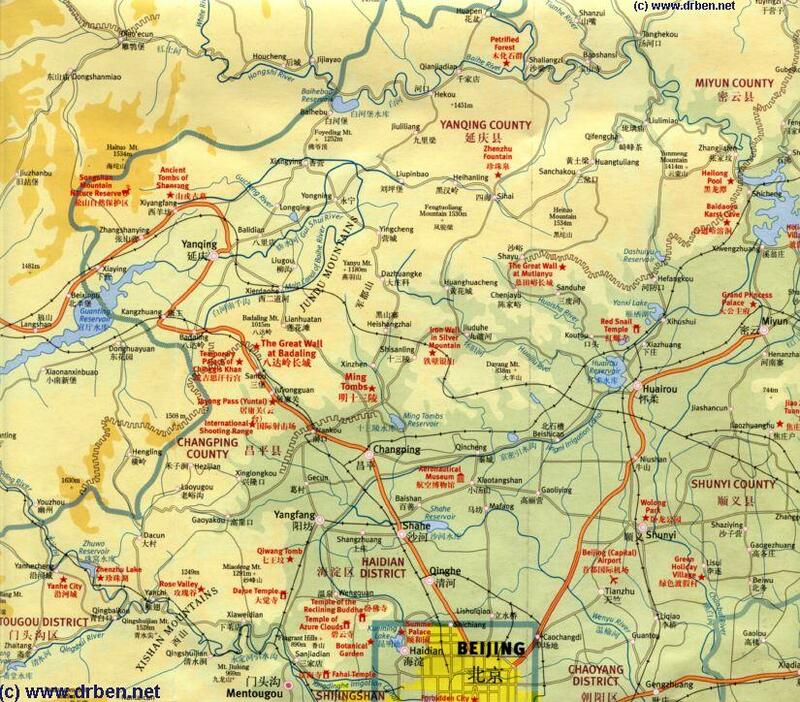 The Inner Suburbs, the 6 Outer Suburbs and the 4 Rural Districts of Beijing. Map of the Northern Half of Beijing Municpality, marking Shunyi as a red dot and Changping as a Blue Dot. The Badaling Expressway connecting the City Center to Changping and the Badaling Pass of the Great Wall of China can be followed from the 3rd Ring Road. 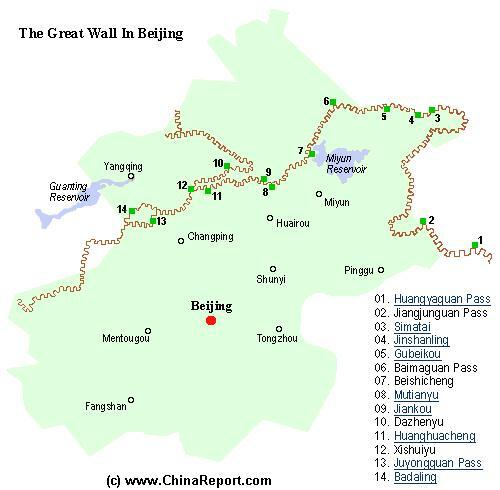 Browse the Map to Find the Great Wall at far away Yellow Cliff (HuangYaGuan), little known JiangJun Guan, Steep and Eroded Simatai, world famous Jinshanling - the longest Great Wall Site in existence, Gubeikou, White Horse Pass (Bai Ma Guan),Beishicheng, Mutianyu, Jiankou, DaZhenyu, Huanghuacheng, XishuiYu, Juyong Guan Pass and Fortress, and finally Badaling the most visited Great Wall of China Site in the Peoples Republic.